Achieve a fabulous appeal on your special day with the 1966 Red Convertible Mustang! Looking for Mustang Classic Car Hire Melbourne for any occasions? Exclusive Limousine is leading luxurious car rental company based in Melbourne offering extensive range of fleets for hire at affordable price. We offer mustang hire Melbourne for all occasions that include birthday parties, wedding, official parties, weekend parties, etc. Some people want their transport to be bold and masculine. Ford Mustangs always turns heads even in this age. The classic muscle car painted in red with an open hood creates an unparalleled riding experience which stays only as a dream for most. Now you can make this dream come true by hiring the 1966 red Convertible Mustang from our fleet of cars. Be it on a date or celebrating your birthday – arriving in the classic Mustang will leave others in awe and make your event the most memorable one. Book classic Mustang from us and get ready for luxurious travel experience. You can call in 3 of your friends to join the ride. Power, manliness and style – that is how people think of Mustang. If you’re looking for a mustang at an affordable rate for your next big party, you know just where to call. So book one from our company at affordable rate and get ready to rock the party. 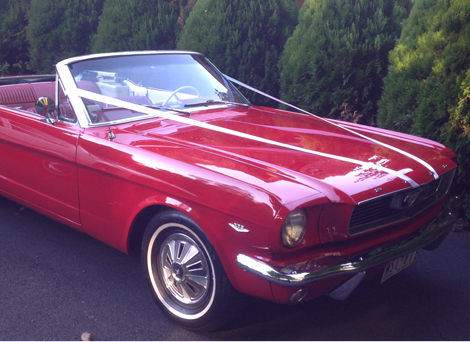 This 1966 Red Convertible Mustang classic car hire Melbourne is best for any occasion such as weddings, birthdays and school proms among others. It will also give other special occasions a touch of class with its elegant appeal. Due to massive demand, make sure to book mustang classic car hire in advance for luxurious travel. Call 0428 486 637 for instant quotes and attractive deals. As the leading luxury transport provider in Melbourne, we not only offer a satisfaction-guaranteed service but also fabulous and classic luxury cars that are difficult to find elsewhere.